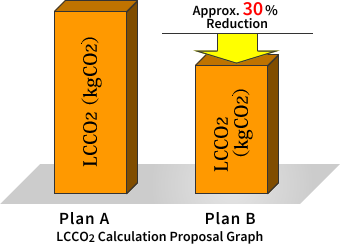 To reduce negative environmental impact, we have implemented a project proposal method that incorporates a running comparison of CO2 emissions, a major cause of the global warming. We have concluded that for the future, LCA is a more accurate representation of environmental impact. Issued by Architectural Institute of Japan, Architectural LCA tool ver. 4.04. LCA calculation using our own methodology, based on 1995 industry-related data, Resource Sustainability Assessment. In addition to the amount of CO2 emissions in the production stage, we will create a proposal that takes into account the CO2 emissions up to the manufacturing and transportation stages. We will quantify the total CO2 emissions In the manufacturing and transportation stage while simultaneously making the final estimation available for decision making. We are commuted to reducing CO2 emissions generated at the construction site and understanding the issues. We believe it is our social responsibility as a company in the construction equipment industry. We are promoting activities to reduce CO2 by using construction methods that are friendly to the environment. We will use planning and implementation methods at all of our construction sites with the aim of moving towards the advent of a low-carbon footprint society. We have been compliant with environmental laws and regulations with appropriate processing measures, and have promoted cooperation with other companies to reduce industrial waste. We have also actively implemented efforts to follow the principle of the 3Rs (Reduce, Reuse, Recycle).